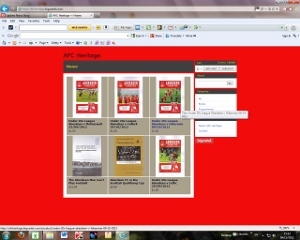 The AFC Heritage Trust recently opened up modest online store as a further means of fundraising for the cause. Supporters will be able to use the Store to obtain specialist books, programmes and memorabilia thatmay be hard to get elsewhere. Trust Chairman, AllanMcKimmie said: "Fundraising is challenging for any charity in the current climate but we are hopeful that Aberdeen supporters and other interested people will feel that they cannot only help the Trust but get something worthwhile in return by using our shop. There are plans to add a number of unusual Abereen Heritage related items in the near furure, so please do have a look at The AFC Heritage Storeand help us to build up the Charity through buying our wares."